The Christmas fair is a Saturday-Sunday event in the middle of November at the Scandinavian Centre. More than thirty vendors participate, displaying and selling their merchandize . baked goods and much more. Lunch at the Christmas fair: We serve glögg, Swedish pastries, open faced sandwiches and even rice porridge. While eating and shopping: Musicians performing Swedish Christmas music will entertain you. Fun for Kids! Visit the Children's Corner to make Christmas crafts or watch a cartoon or two. 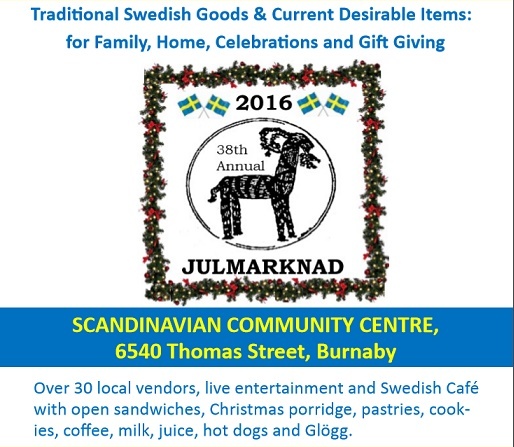 We have over 30 vendors selling everything you can ask for (Christmas related of course) to get a fantastic Scandinavian Christmas! Please download the following three pdf-forms, fill them in and email them to Swedish Cultural Society.